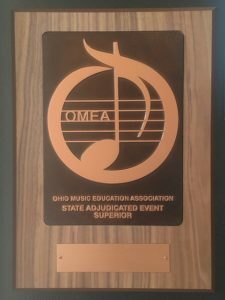 On Saturday April 21st, the Warren G. Harding High School Symphonic Band traveled to North Royalton HS to participate in the OMEA State Band Adjudication. The members of the band prepared 3 pieces for the judges and had to sight-read a new piece of music. We are extremely proud to announce that the Symphonic Band received an overall rating of Superior (I). Congratulations to Mr. Young, and all of the students in the Symphonic Band! The John F. Kennedy Center for the Performing Arts Any Given Child Initiative in Warren City Schools introduces students to art experiences and art-based learning designed to help them use their creativity to discover themselves and make meaningful connections with others. Warren is the smallest of the 25 school districts selected nationwide by the Kennedy Center and the only one in Ohio. Students involved in the program share their thoughts on the integrated arts initiative in this video produced by Jim Fogarty of 2 Ticks & The Dog Productions that was shared at an April 10, 2018, news conference.